August 17, 2012  Lakhdar Brahimi, a former Algerian foreign minister and longtime U.N. troubleshooter, will try to broker a peace between the Assad regime and its opponents. 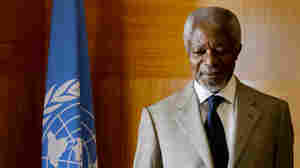 August 2, 2012  Annan could never bridge divisions both in the country and within the United Nations Security Council. July 10, 2012  The pro-opposition Syrian Observatory for Human Rights estimates around 12,000 of those killed have been civilians. 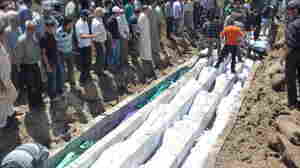 May 29, 2012  Fewer than 20 of the 108 people killed Friday in Houla died from artillery fire, according to the U.N. High Commissioner for Human Rights' office. Syrian diplomats are being expelled from countries around the world in response. May 27, 2012  The nonbinding statement had the support of Russia, an ally of Syrian President Bashar Assad. The U.N. says at least 108 people, including 49 children and 34 women, died in the town of Houla. April 11, 2012  Forces loyal to President Bashar Assad continue to attack those who oppose the regime, activists say. March 27, 2012  President Bashar Assad's regime has previously agreed to other peace plans, however, to little or no effect. And there are reports of fighting today near the border with Lebanon. 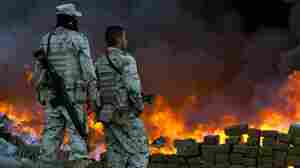 June 2, 2011  The effort has had "devastating consequences for individuals and societies around the world," the Global Commission on Drug Policy says. Its members include former Secretary of State George Shultz and former U.N. Secretary General Kofi Annan. The panel's report says governments should end the criminalization of marijuana and other controlled substances.